Visitors to this Farmington home weren’t even sure how to get from the driveway to the front door! 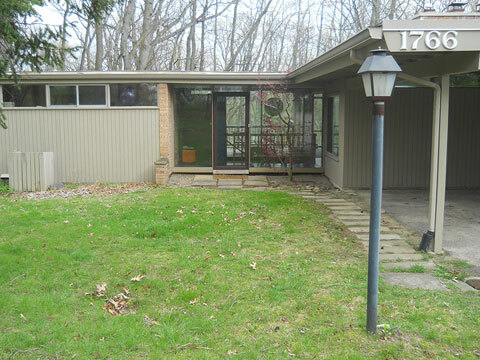 The home was characterized by busy lines, a confusing entry configuration and not a whole lot of curb appeal. 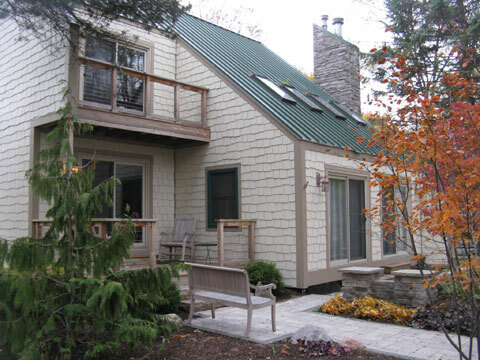 After consulting with the Client, the entryway configuration and complete exterior update were designed: custom landscaping, stone courtyard and walk, cultured stone chimney and maintenance-free composite siding and trim. 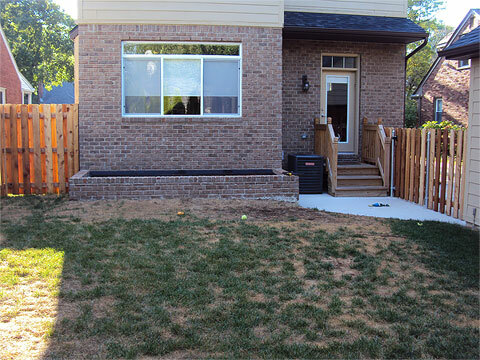 Bare and unusable, this small Birmingham back yard needed to be re-designed to reflect the owners’ lifestyles. A deck and outdoor kitchen was built that featured a built in grill, seating benches and granite counter tops. 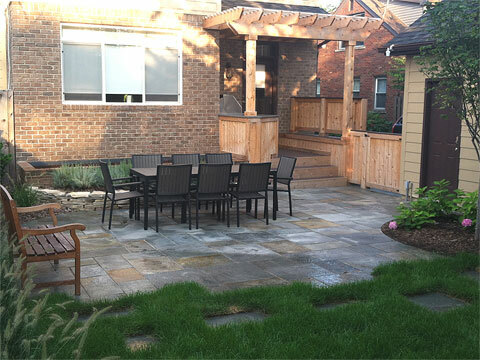 A spacious bluestone patio was designed to accommodate a large dining table for large gatherings. 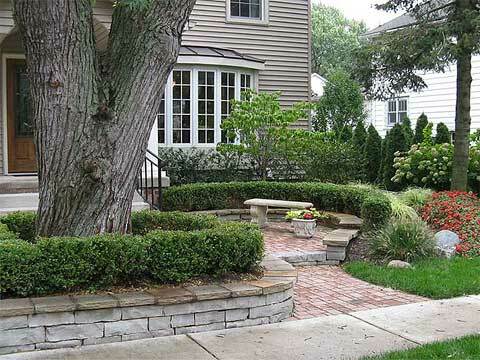 The resulting spaces are surrounded by lush plantings and splashes of color and texture throughout the back yard. 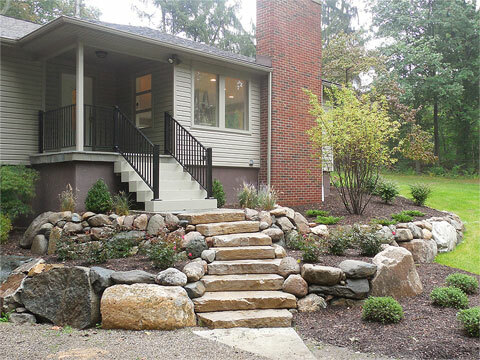 This unique Ann Arbor home was in need of a reconfigured entryway and front yard landscape. 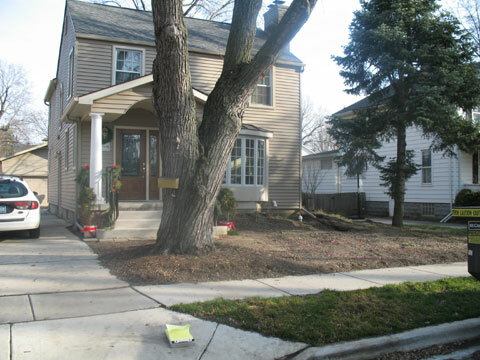 Since the yard sloped toward the house, a new drainage plan was also required. The new design provides a clean, contemporary way to welcome visitors, and manage runoff away from the structure. The concept includes re-shaping of the yard, stone retaining walls, and a large, open bluestone walk, surrounded by lush plantings. The new space is finished off by natural boulders, a dry stream and a stone bench. 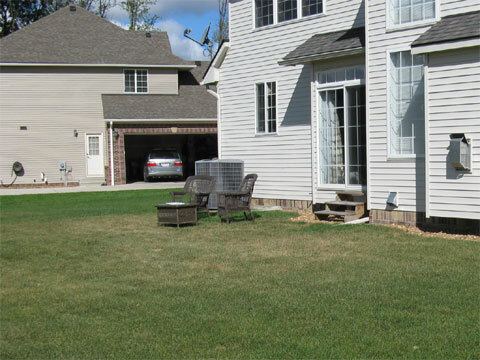 This Wixom residence had little going on in the back yard. A design was created that connected the home with the new pool area, resulting in a large paver patio with several areas to relax, cook, and entertain. 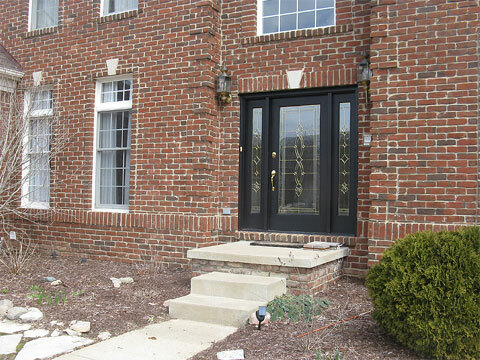 A beautiful older home needed exterior updates and a more welcoming approach for visitors. An entire landscaping makeover included a brand new planting scheme in the front, reconfigured front entrance of bluestone and Unilock stone planter boxes for visual interest. 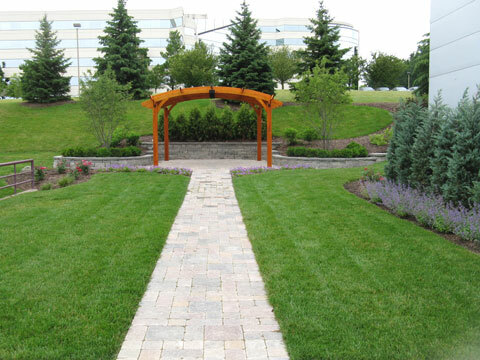 BEFORE: A major regional luxury hotel in Novi desired a lush but natural wedding area, capable of seating 300 people, but hidden from the view of surrounding buildings. AFTER: The same area - landscaped with a cedar pergola, paver patio and aisle, stone retaining walls, landscape bloom color all year and 22' evergreens brought in to screen the lines of sight. 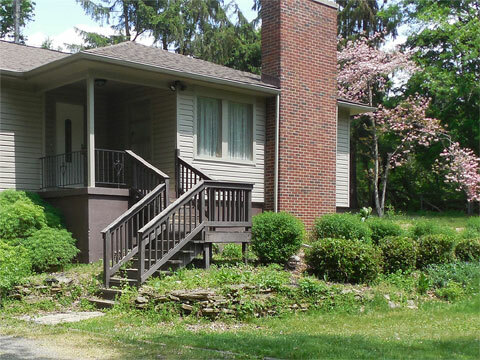 BEFORE: An older Plymouth home after undergoing major inside renovation and addition. 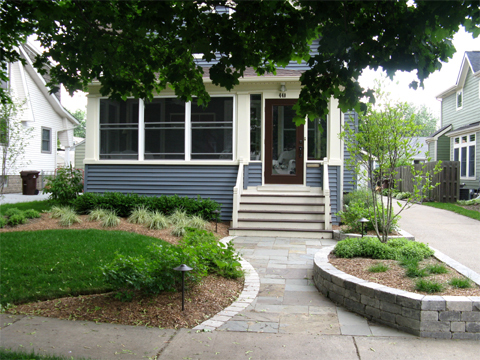 AFTER: The same home, with paver stone entryway and planter walls, lush and formal hedges and plenty of seasonal landscape color. 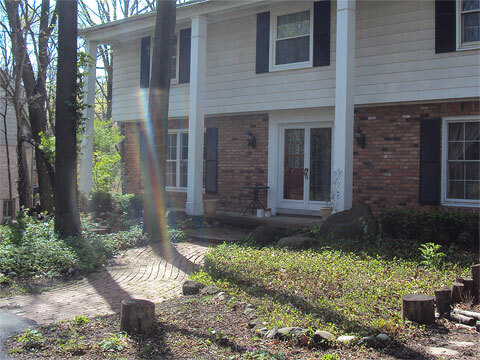 The old, crumbling brick path in front of this Farmington Hills colonial was awkward and dated. 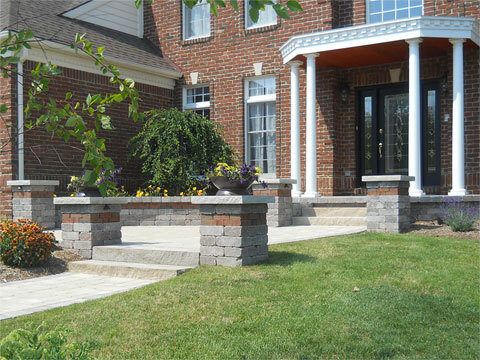 The owners sought a new approach for the front landscape - one that included a wide, welcoming entryway and small seating area. The new design added natural stone steps, new boxwood hedges, and plenty of plants to provide year round color. 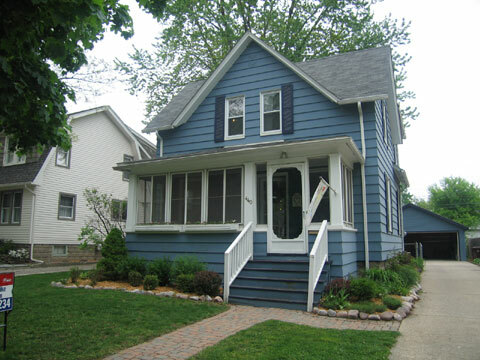 The original porch on this Novi colonial was much too small, and out of scale with the rest of the home. The Client desired a grand, covered entryway that would welcome guests (and keep them dry in the rain.) The new entryway design includes a brick paver walk, brick pillars, a raised brick porch and a covered portico with fiberglass columns and matching house trim. 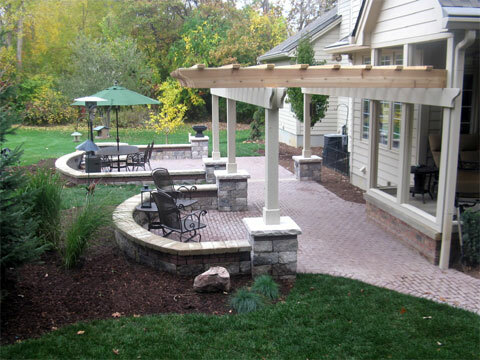 From bare South Lyon, MI yard to patio, pergola, courtyard walls, and a firepit area. Walls and columns are Unilock Brussels dimensional system. Pavers are Brussels Block and Unigranite slate. Pergola structure is stained cedar. 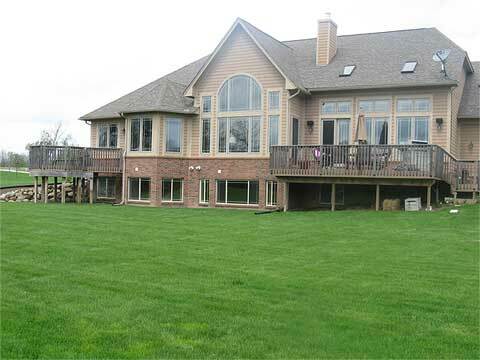 The owners of this Howell MI residence wanted a large, open patio space to enjoy their tranquil back yard landscaping. It had to have some shade, some sun and a place to gather around the bonfire. 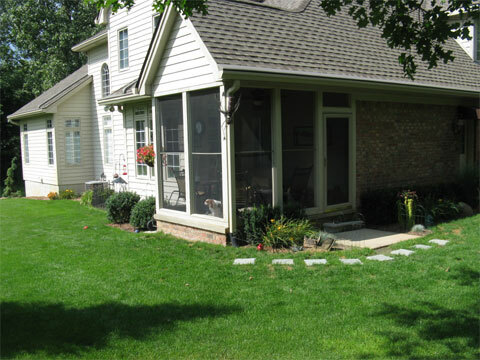 A landscape design was created that integrated the existing enclosed porch with a large paver patio, courtyard walls and pillars. 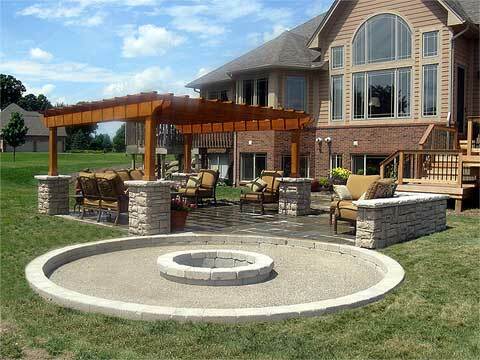 The patio included a small, shaded seating area under a pergola, an integrated fire pit and a large open space for gathering and dining. 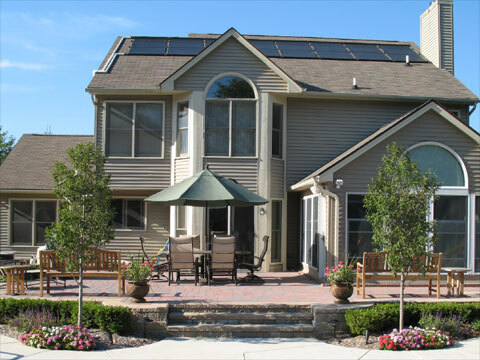 With a beautiful, open yard but nowhere to sit in the shade and relax, these Ann Arbor homeowners needed a space that offered it all. 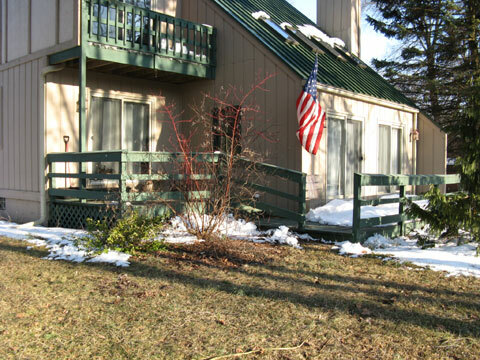 The old, cramped deck was expanded and rebuilt with maintenance free composite decking and rails. A new deck staircase leads to a large bluestone patio in the back yard, with dappled shade cast by a cedar pergola. Cultured stone pillars and walls surround portions of the patio to create a cozy, private area for 10-12 people to mingle comfortably. The new landscaping features a sunken firepit area big enough for 6-8 to relax around the fire. 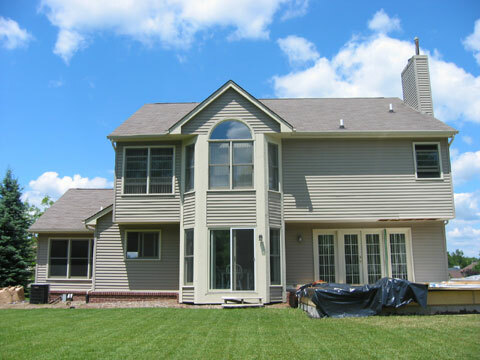 This West Bloomfield home underwent a major landscape renovation in 2010. 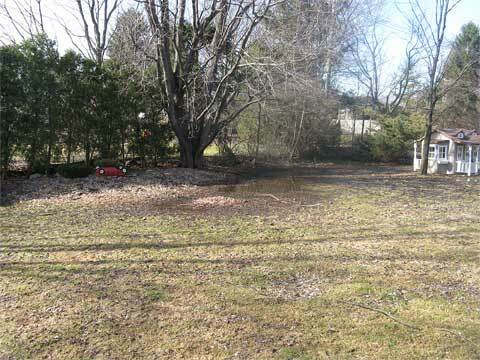 The backyard was soggy and unusable, with no relaxation space. 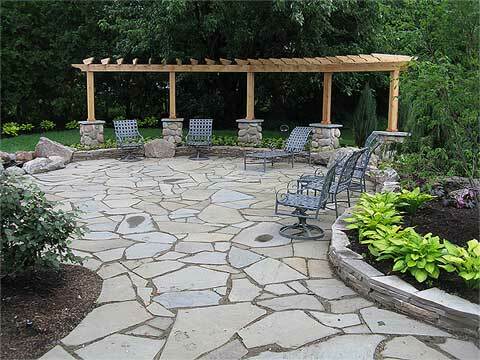 A 1000 square foot stone patio was built, with a rustic firepit built from 400-800 lb boulders. 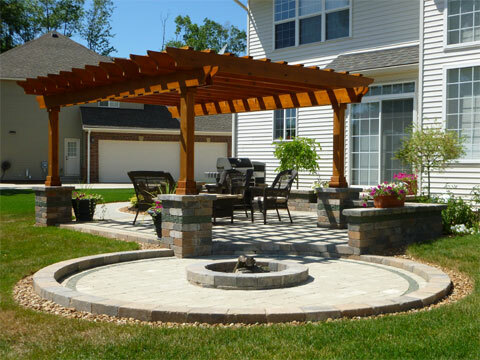 To create an enclosed "courtyard" feel, a flagstone wall surrounds a portion of the patio and is accented by a cedar half-pergola. 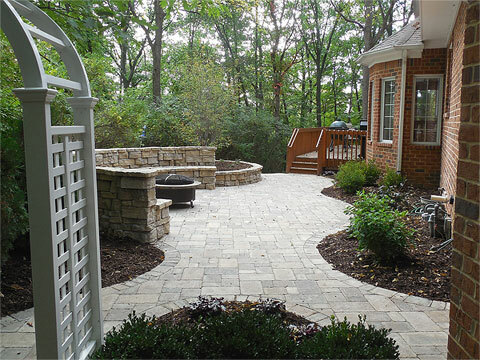 A walkway connects the stone patio with a raised paver patio, built to accommodate an outdoor dining area. 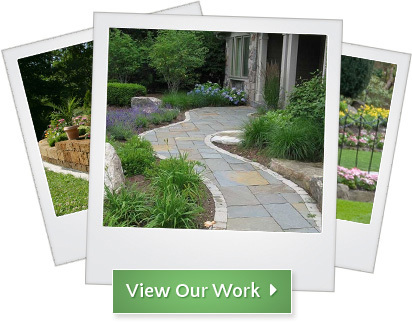 Lush, colorful plantings and ground covers soften the hardscape areas throughout the landscaping. 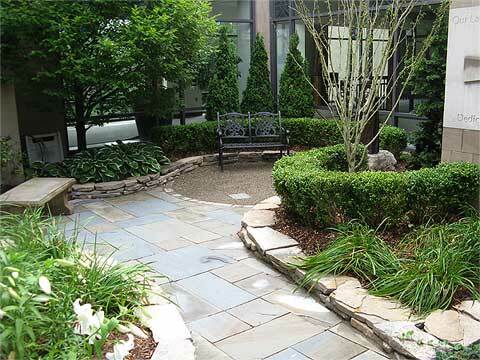 Adjacent to the entrance of this large church in Plymouth sits a small, secluded prayer garden area. The original area was overgrown, busy and unusable. 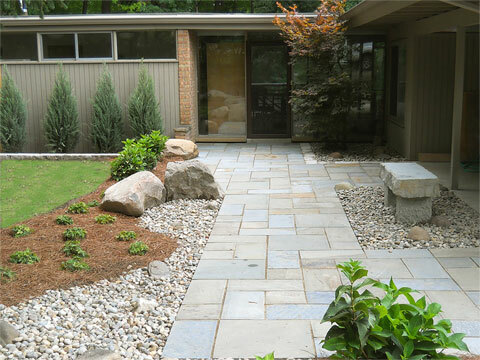 The new landscape design called for a stone walkway and gravel seating area, surrounded by flagstone walls and evergreen plantings. 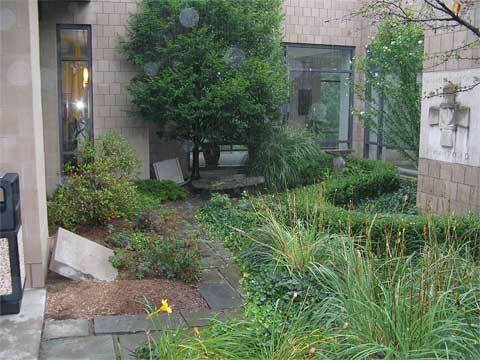 It includes large accent boulders, and a custom-built bronze statue as the garden's centerpiece. The result is a quiet, serene setting to get away for prayer and quiet contemplation. The front entryway of this home had a chaotic, confusing feel. 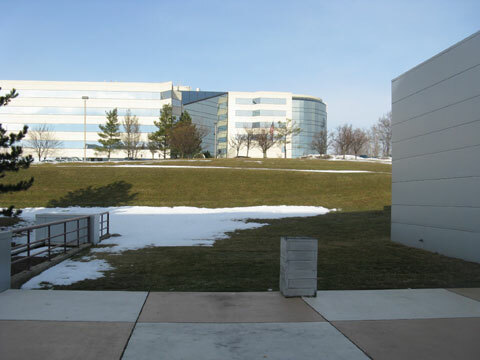 The original landscaping was overgrown, and the small retaining walls were inadequate and in disrepair. A new design was envisioned that moved the entryway into a more welcoming orientation, and increased walkway and parking areas. Granite boulder walls were constructed in tiers to showcase the new plant materials and large stone slab staircase. 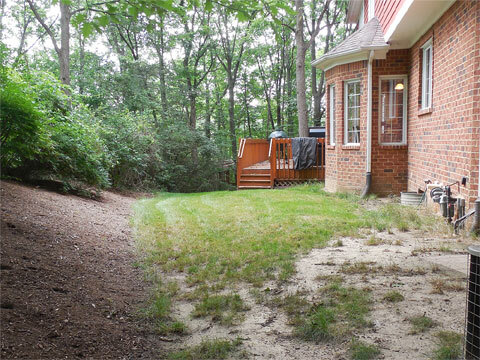 These Ann Arbor homeowners were never quite sure how to use their small, shady back yard. They finally decided on an outdoor entertaining area, and contracted Treasured Earth to design a unique getaway. 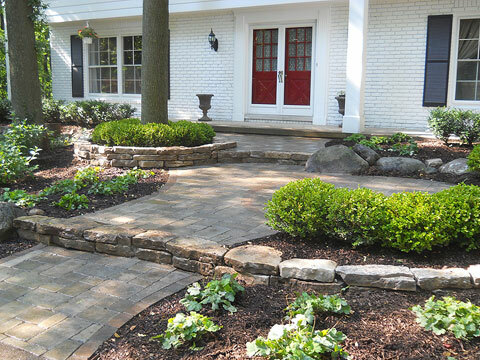 A paver patio was built into the slope of the back yard, resulting in a cozy, natural feel. A Rosetta stone built in bench is the highlight of this new area, inviting friends and family to extend their summer evenings by the bonfire.